Thrift Store Holiday Items--Too Late, Too Soon? It's barely the end of June and the summer season officially started eight or nine days ago. And the Fourth of July is just four days away. So it's not unusual to be seeing the temporary stands (seen at left) with different organizations selling fireworks being set up over the last week or so. And seeing summer toys such as water pistols, swimming goggles, and buckets and shovels in stores is obviously occurring now. But over the last month I have been noticing holiday stuff at thrift stores for Easter, Halloween and Christmas. Why is this? Easter is over and not everyone is thinking about Halloween and Christmas just yet. I'm already dreading seeing the Halloween and then Christmas stuff arriving where I work. We have two new employees who have yet to see any of the seasonal items, but they will be seeing these items soon, before summer is even over. We can expect Halloween first, around mid-July or early August. And expect to see the Spirit Halloween banner at the end of July (as was true last year) on whatever abandoned building they plan to take over this year in your neck of the woods. Last year, in Gilroy, CA they took over the building vacated earlier in the year by Famous Footwear after years of opening in the former Linens & Things building that was taken over by Marshalls last year. Now for the holiday stuff currently at the Goodwill. Why does goodwill think people are going to buy plastic Easter eggs in June? Unless there are crafters planning for next Easter, I'm not sure how many of these are being sold right now. It's almost as weird as seeing Valentine candy at the store in September or Halloween candy just before Christmas, as I have seen in the past. But that's probably even worse-this candy still edible months after the holiday it represents? And these random doo-dads for Easter, just with do people do with these things? I've never seen much use for them, as cute as they may be. Those holiday snow globes always seem cute, but I can't seem to find a place in my house where these things would be safe and not crash to the ground. UGH! I don't even want to imagine what would happen! Halloween is the next holiday (aside from Labor Day) coming up and I can see some people already planning on his one. I'm beginning to wonder what the hottest costume this year will be. And I'm thinking I should re-list my Halloween stuff on Etsy soon to see if any of it sells this time. Last year was my first time selling on Etsy, but it was without success. As I said earlier, don't be surprised if you see a Spirit Halloween store banner on some vacated retail building as early as the end of July even though most such stores don't open till as early as Labor Day weekend. But Christmas already? It's bad enough seeing it in September, overtaking Halloween displays before the calendar switches to October, but seeing it in June seems even worse. Who is even thinking about Christmas in September, let alone now? It's even weirder that all the different holiday stuff gets mixed together on one shelf, almost as if they are trying to make all the holidays into one. Often something once associated with one holiday becomes customized for another. Gingerbread houses, once a staple of Christmas are now made for Halloween as well. That ever- present candy corn? Not just for Halloween anymore. It now comes in all color schemes for all holidays. And according to one blogger, during Halloween season thrift stores often misplace items in that section . I guess they too often associate Darth Vader with Halloween, and think someone will use a Playstation controller guitar prop as part of a rock star costumer. I once saw Halloween candy mixed in the Christmas display at Goodwill and could not help thinking that that is just so wrong, as well as wondering if the candy was still edible after almost two months. I mean, it's bad enough you see Halloween candy in regular stores as early as August. Who buys it then? Also I'd like to note that until about last week the holiday shelf was across from the wall that was carrying the summer toys. The positions of each of these displays has since changed, but the items are still basically the same. It was well over a week ago (last Friday), so I wasn't sure about blogging about it now, but I got so busy over the last week that finding time to blog has been hard. Time to catch up. At the beginning of May, the blog Bella Styles held a contest on Facebook and Twitter to win gift cards from Dots, Sonsi, Just My Size, and Lane Bryant. I decided to enter. You could enter for more than one, but I only entered for Lane Bryant, and you could one win one gift card. It's always fun to enter such things, but the chances of winning are always one in however many. However, only a small number of people had entered, so this wasn't a very competitve contest. When I checked the winners results on May 31, imagine my surprise when I saw that I was winner of the LB gift card for $100. I received it in the mail the second Monday in June and and used it 11 days later. As I had back in January, I took advantage of Lane Bryant's semi-annual bra sale, "buy 2, get 2 free." I only get initimates from this store, since I'm not really a plus-size, except in the chest (TMI???) I won't get into much more detail :-) But I had a hard time deciding and was in the store for about two hours, as was the case last time. This time I also bought some sleepwear, also on sale. I saved over $100 on over $200 of merchandise, and since I had the gift card, I only had to pay a little over nine dollars more. I loved this sale! It may be a while before I need more, but I'll be back for underwear at Lane Bryant. The gift card came at a perfect time! And while I'm on the subject of Lane Bryant, some of you who shop there or at one of its sister stores Fashion Bug and Catherines, you may have heard the company owning these stores has been sold to the company that owns Dress Barn. The company will be closing the Fashion Bug stores as a result of the sale. Lane Bryant and Catherines will remain open, however. This news has had many shoppers protesting, especially on Fashion Bug's Facebook page. A lot of them say that they can't afford the clothes at LB, Catherines or Dress Barn. I then thought of someone I once worked with. She worked for the Fashion Bug in Gilroy, CA, in the same building strip where I work. It closed about a year or so ago. The girl I know who worked there said it had too much competition from Old Navy two doors down and from Walmart a block away. Yeah, those stores are obviously cheaper. I only went into the Gilroy, CA Fashion Bug once or twice when it was still around. I never bought anything, not even the bras, which are about the same sizes that Lane Bryant carries. Didn't think of that then. I did see this girl I know working at Fashion Bug at the time. She has since gotten another clothing retail job, but I shudder to think that she would be needing to look for one soon if the Gilroy Fashion Bug had stayed open until now. It's too bad this chain had to close entirely. Not sure if I can afford to shop at Dress Barn, a I have only been to one sore, at the outlet center in Gilroy. Not sure of the prices, as I just passed thru the store, barely glancing at anything. I'm guessing the gift cards for Lane Bryant will now be used at Dress Barn as well since they are now owned by the same company. We'll see. Patriotic pop culture. What movie, TV show, comic book, etc. makes you want to stand up and salute Old Glory? I got to thinking about something I always want to do when any holiday comes along, but rarely have time to do so: make desserts for the holiday. Working often makes me too tired for this. But even when I do, July 4th is one holiday I don;t normally consider for such. I'm always desiring to make a pumpkin cake for Halloween or a some Christmas cookies. But rarely do I think of making desserts for July 4th. I recently got addicted to Pinterest, as have a lot of people, and one boards I created is Holiday Stuff, with photos of holiday desserts and decorations. I also created a board called Desserts That Look Good, and wonder if I ever will make any of those either. (This board is for non-holiday-themed desserts, and is something I'd like to blog about later). I surprised my self with some of the Forth of July desserts I pinned onto the board. With the day almost a week away, I'm not sure if I will even think of making any of them. Spangled Sandwich Pop. This seems easy. First, skewer mini ice-cream sandwiches on popsicle sticks. Then, press the exposed filling into a plate of sprinkles or nonpareils.To keep mess to a minimum, serve the pops in colorful cupcake liners. To keep mess to a minimum, serve the pops in colorful cupcake liners. Another dessert that looks tempting to try. I have the cake pan, but will I have the time? There are other July 4th desserts I pinned, but that is all I want to discuss. You can see them on my Pinterest page (links above). My whole story is I often want to make something like these, but rarely find the time and energy. I don't know how others do it, when they have children and I don't. It always seems like a good idea when you first see it. And I don't yet know what I am doing for the holiday this year. You prefer music that is upbeat and energetic. You love anything you can dance or move to. You are sunny and cheerful. You think the world has good things in store for you, and you refuse to believe otherwise. You are trusting, even though you've been burned before. You refuse to be bitter or jaded. You know you've got what it takes to make it in life. You trust in yourself above all. Quiz: Are You Gap, Banana Republic or Old Navy? I took this even though I rarely got to any of those stores. You are a wholesome person. You live a low-key, low drama, and healthy life. You are emotionally stable. You understand what matters most, and you prioritize well. You know where you're going in life... and why you're going there. Social pressure doesn't get to you. You are dependable and trustworthy. Your friends know that you're solid and true. This seemed fairly easy, but the hard part was narrowing it down to just 10. I'm only including ones I have on DVD. These are in no particular order. 1. What About Bob? I have seen this numerous times, starting with its release in 1991. I didn't get on VHS (I rarely ever got any movies that way), but found the DVD at target for only $5.50. Still laugh when I see this one. "I'm sailing!" "Keep, sailing, Bob." 2. 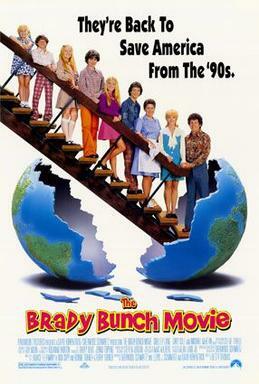 The Brady Bunch Movie I knew I had to see this since I love watching reruns of the TV show. Another I have seen numerous times since its release. Some of the funny parts re the modern-day references that confuse the Bradys, like when Marcia asks a model "What have you modeled for?" and Marcia misinterprets it when the girl says "Guess." 3. 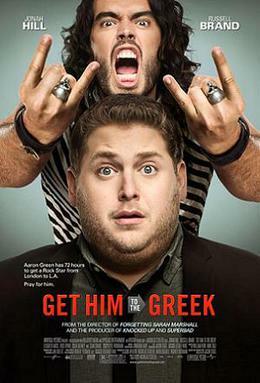 Get Him to the Greek Saw the previews and knew I had to see it. Very funny spoof of the music industry. I then had to rent My Favorite Year, whose premise was nearly the same as this one. 4. Marley and Me When I saw the previews, I knew I had to see this one. I never did get around to seeing in the theaters, though and added it to Netflix. I then decided to read the book first, and received the movie more than month after reading it. 5. You, Me and Dupree A rare event when I saw this in the theaters more than once before getting the DVD. Loved the minute I first saw it. Anything with Owen Wilson is sure to be funny. 6. 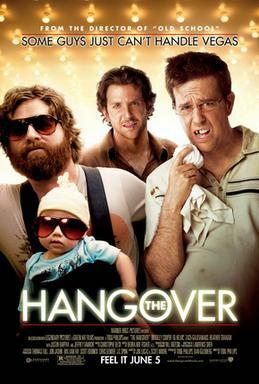 The Hangover It's funny, Zack G. is great, the antics in Vegas are funny, what more can I say? 7. 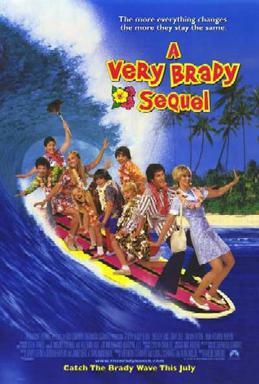 Very Brady Sequel Just as funny as the original, as the Bradys are just as confused as ever. 8. Shrek Loved them all, but the first is the best of all. Seeing the standup poster in the theater lobby in 2001 made me know I wanted to see it. Who knew then that it would be such a smash? 9. 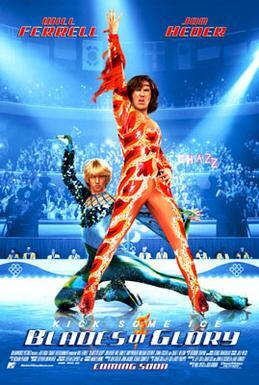 Blades of Glory I'll watch just about anything with Will Ferrell, and having seen Jon Heder in Napoleon Dynamite and The Benchwarmers, I knew I had to see this, as well as having seen the previews for this one. Loved this one, just like I knew I would. 10. Grown Ups As soon as I knew about this one, I could not wait. 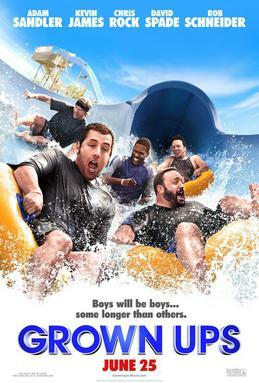 It was just as funny as I thought, and I could not wait to get the DVD. I'll watch anything that has Kevin James or David Spade or any of the others in the ensemble. There was hardly a scene that didn't evoke a laugh. 1. An Education I waited several months till this one came to my town, and the wait was worth it. Pretty good for a period piece, early 60s England. 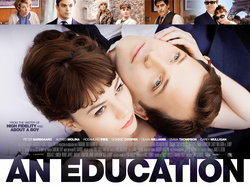 I have since seen Carey Mulligan in other films but her best work is here. 2. Old School As I said, I love just about anything with Will Ferrell and the same can be said about movies with Vince Vaughn and Luke Wilson. What more can I say, this is a load of laughs! 3. Bring it On Another one I have seen many times since it was released. The sequels were ok (though I did not particularly like the second movie) but as is often the case, the first one id the best. 4. The Help I read this first, as soon as I knew about the movie. Very moving for a period piece. 5. Never Been Kissed Yet another I have seen since it was first released and have never gotten tired of it. Drew Barrymore is great as always. Still hard to decide on just a few as there have been too many favorites of mine. I could go on all day with this! This isn't even half the movies I have on DVD (and on a side note, some of those are music DVDs and TV show DVDs). 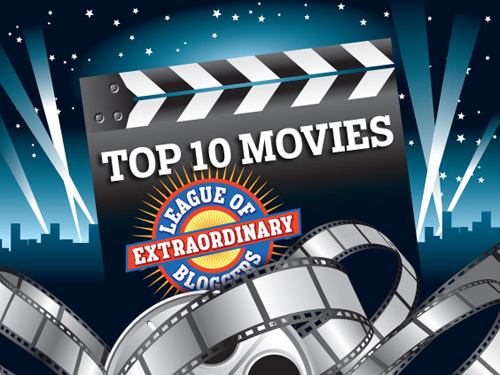 And there are lots of movies I loved but haven't gotten around to getting on DVD. And some recent releases I plan on getting on DVD when it comes out. Definitely want to get The Hunger Games on DVD. Is This What They Mean by "the June Gloom"? It sure has been strange weather this year in my neck of the woods. In January it felt more like spring than winter. Now for the last two days in June there has been un-summer-like weather. Yesterday it rained. No rain today, but the sun hasn't exactly been out all day either, just off and on. It's been somewhat cold today. The last time I recall it raining in June in my area was in 2005. It rained so hard that June in fact, that the rain leaked through the roof at the store I worked at at the time. As I also remember form that year, it rained at least once every single month. Strange that I can remember how much ti rained seven years ago, but that right now I can't recall how many times it's rained this year so far. LOL! But I now wonder if we can expect rain later on in the summer since it didn't rain rained very little in the winter. In January, it seemed weird not to have my jacket on, but there would be times when it would be too hot for the jacket. Putting my jacket on yesterday during the June rain, however, felt weird, as my jacket usually gets hidden in the closet at this time of year. Will there be more rain this summer? I hope not. Wait for winter, please.